The customer service guys at Highland have noticed a real run on two products lately, both by the Abatron Company. The first is called WoodEpox and the other is Liquid Wood. Now when I studied concrete in college (did you know there are people who take entire college courses in concrete? ), they told me that the Egyptians and Romans were the first to make extensive use of concrete in construction. Look at the aqueducts and the other major engineering projects still standing in these cultures and you can appreciate the massive use of concrete even in that time and place. Look around you anywhere in our cities and try to picture making any kind of large structures without concrete and you get some idea of how important it is to be able to make a solid permanent shape by preparing a form and pouring in a semi-liquid. Then along comes Abatron’s WoodEpox and Liquid Wood, allowing civilization to take another step forward. With Liquid Wood, simply mix it up and paint it onto a decayed wooden surface and it will absorb into the wood and return the wood to something very close to its original condition. For instance, if you are turning a bowl and find a punky spot where normally you would put in a little CA glue to harden it up, this stuff works much better. You can sand it, cut it, turn it, shape it and paint it just as if it were the original wood. If some of the wood is missing, you apply Liquid Wood first to firm up the underlying layer and then use WoodEpox to reshape the part that is missing. The guys at the store say the mixture is about the consistency of a dry pie crust dough (don’t ask me if any of them could actually make a pie) so you can shape it, make a form for it, and work it close to the finished shape before it hardens. You can also tint or stain it if you want. Then after it hardens to a compressive strength of 5000 psi (about twice that of regular concrete), you can continue to shape and sand it with regular woodworking tools until you achieve the final shape. You can paint it if you need to and it’ll blend right into the surrounding work and nobody but you will ever know it’s there. The possibilities are endless, but one big usage that comes to mind (particularly in neighborhoods like the one where Highland is located) is window sills. The houses there were mostly built in the first third of the last century, and some (well, many) of the window sills are beginning to go. 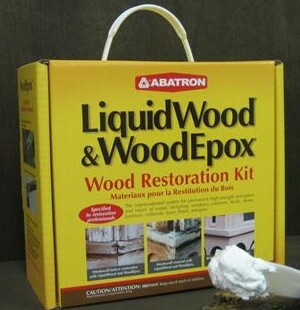 This stuff is perfect for repairing them — knock off the really rotten stuff, paint the rest with Liquid Wood, reshape the window sill with WoodEpox to match the remainder, prime and paint, and you are off for the rest of the weekend. How can you beat that? The Romans would have been proud. You may even find yourself thinking about building an aqueduct next weekend. Not rotten wood, but carved Basswood handles for walking canes. I want to carve dogs, birds, etc., and while basswood is the carving wood of choice, it’s not very hard and it is critical to have it hold up under weight. Would any of these products, after tthe handle is carved, served to strengthen the wood? If it does, can it take stain or paint on top of the product? I’m a great believer in preventing problems before they appear. Would this do the trick? These products are very much like Bondo you would use to repair sheet metal on a car. They will bond to wood very well and have some shaping time before they dry, but then does not lend itself to shaping once dry. It will take paint since that is what it is designed to do, but stain not so much. I’m not sure I would be willing to trust it on the handle of a cane where failure could be injurious to the user.